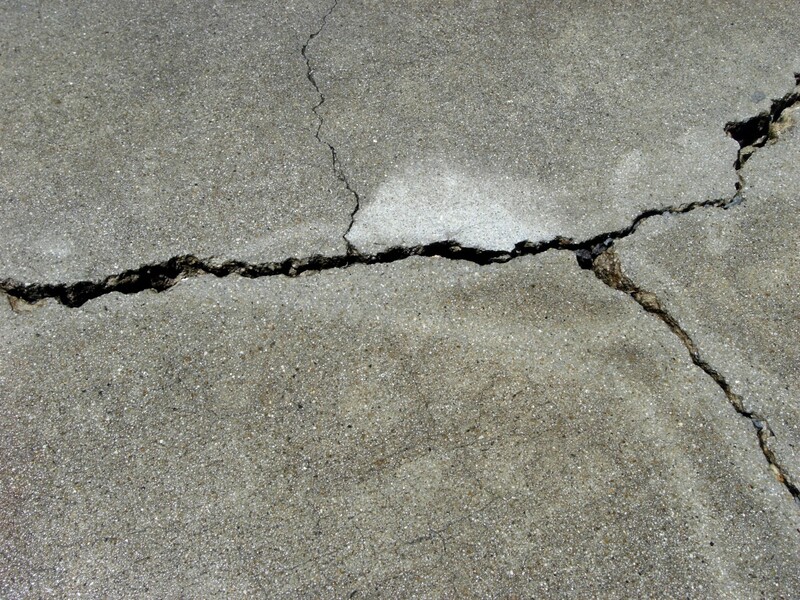 Why Do Concrete Slabs Crack? 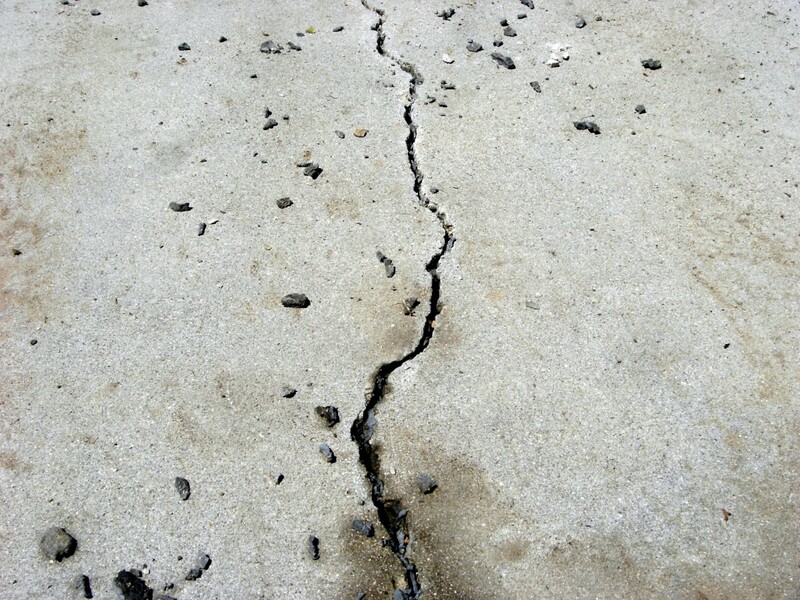 It can be very difficult to pour a large concrete slab or driveway without having any cracks at all, and over time, settling of the ground beneath the slab will very often produce ever more cracking. Nearby trees or large bushes often grow under the driveway and lift portions of it, creating more cracks as well. In the case of a driveway, heavy motor vehicles add to the problem as the weight is concentrated over a small area. Once cracking has occurred, the problem gets worse. 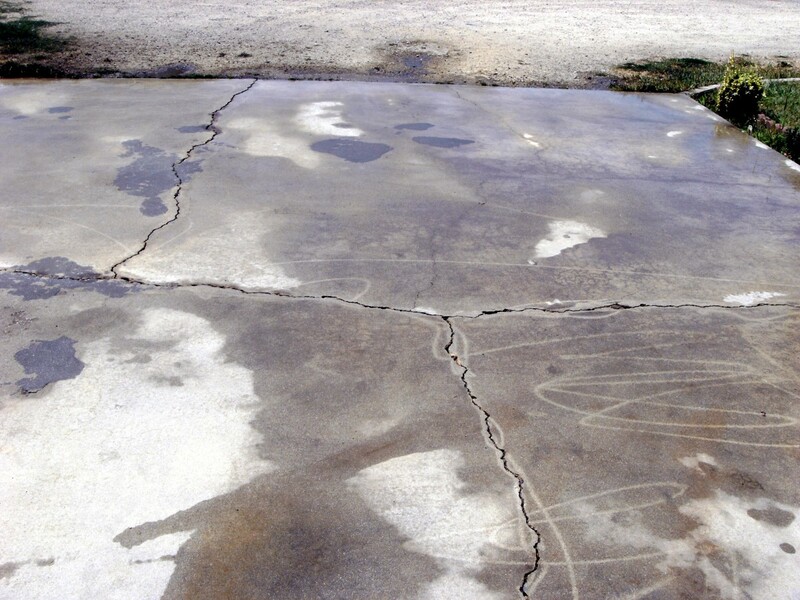 In climates where freeze/thaw cycles are common, water works its way into the cracks and freezes, expanding and crumbling just a little more of the concrete. It may thaw the next day, only to repeat the process again that night. 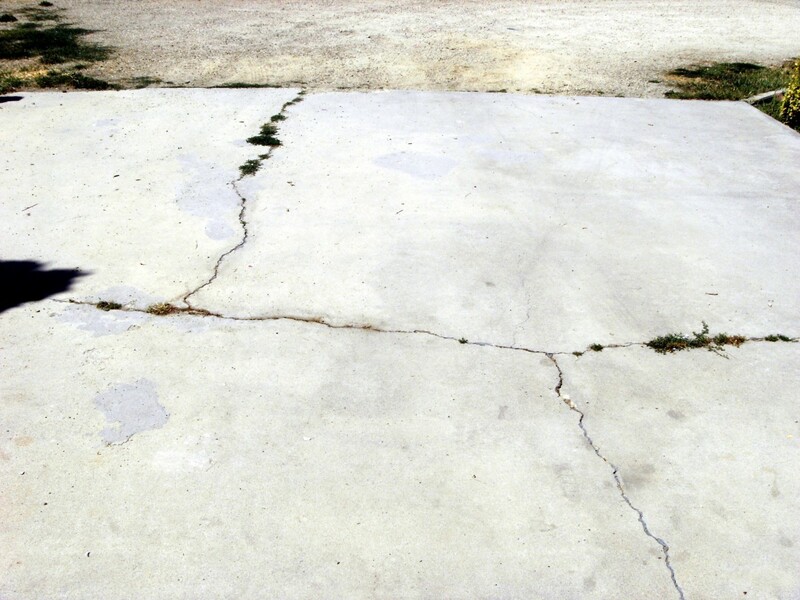 It is imperative that this damaging cycle be stopped as soon as possible; any cracking on an outdoor slab needs to be repaired, with the cracks filled. In addition to the freeze and thaw cycles that may occur, eventually the cracks open enough to get small amounts of dust and dirt in them. Once that happens, it is only a matter of time before vegetation makes an appearance and begins to grow in the dirt filled cracks. 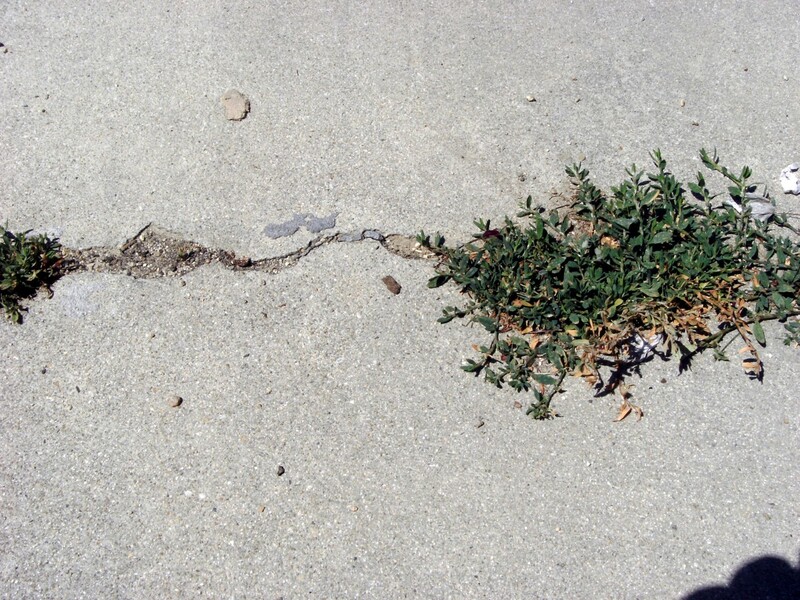 Just like larger trees and bushes, even grasses and other small plants will cause damage to the surrounding concrete, slowly crumbling it into every larger cracks. The process builds on itself; plants open the cracking just a little, letting in larger plants, which cause even more damage and the process repeats once more. 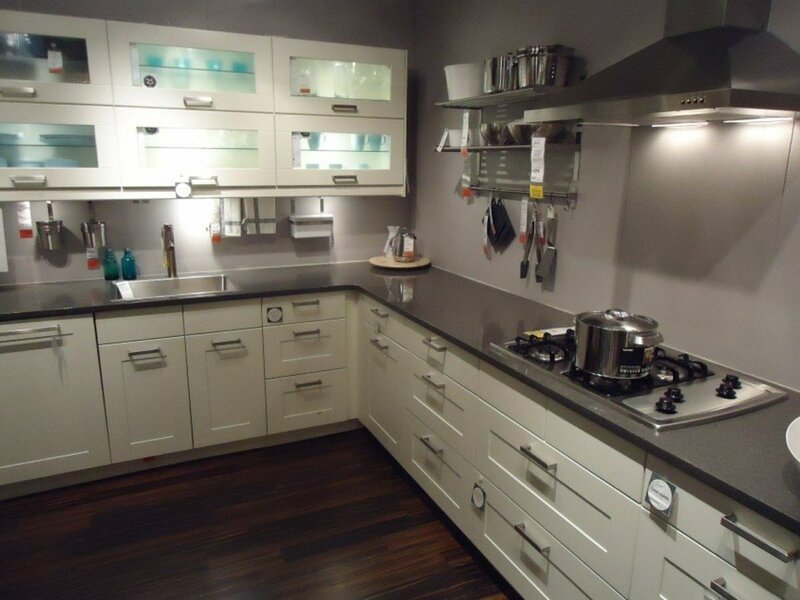 There are a variety of products available for the task, and they give varying results. 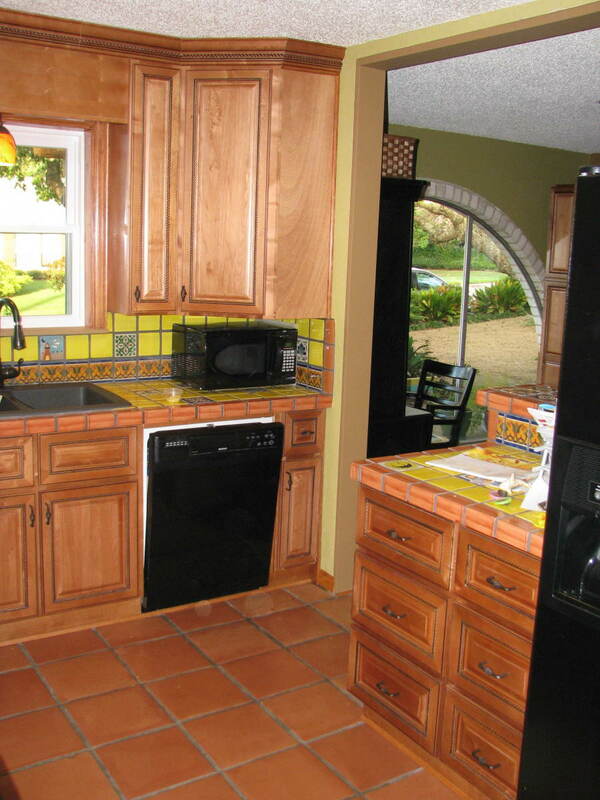 As you might expect, the cheaper and easy to use materials don't do as well; as with most home repairs better quality materials coupled with a little more work usually yields the best job. 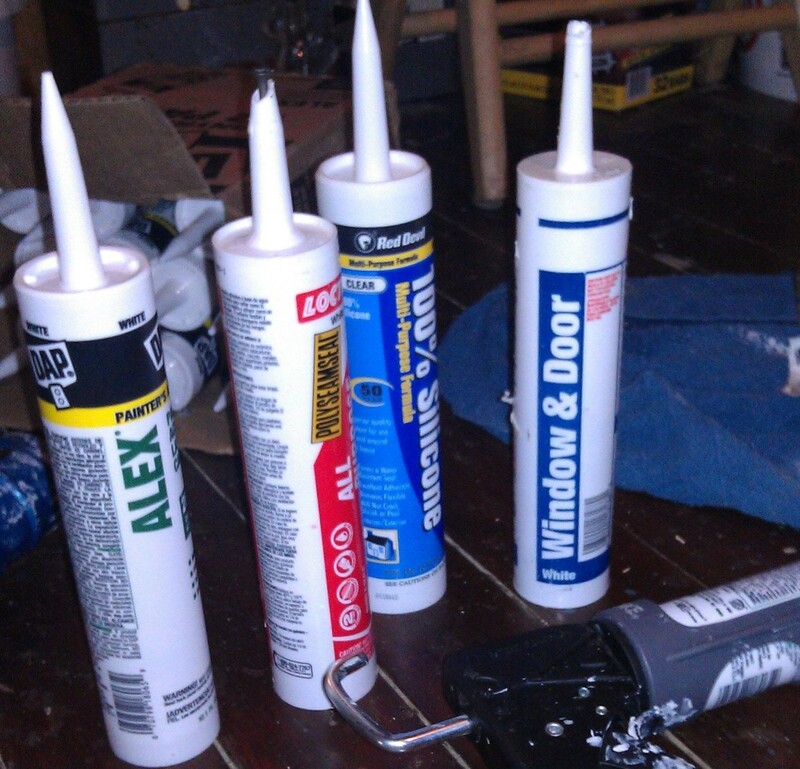 At the bottom of the list is caulking like material advertised for filling concrete cracks. 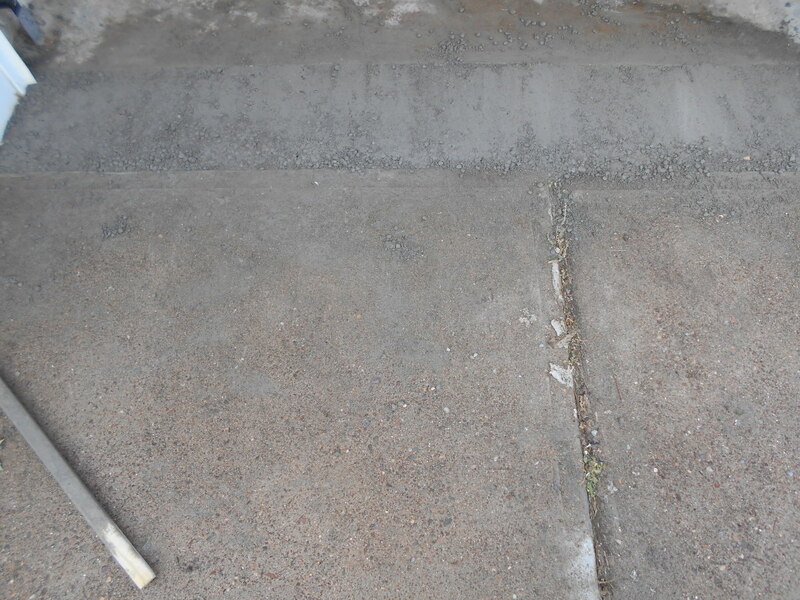 Generally available in either a squeeze bottle or a caulking tube, it is simply squeezed into the cracks and is what was used just two years ago on the driveway in the photos shown here. 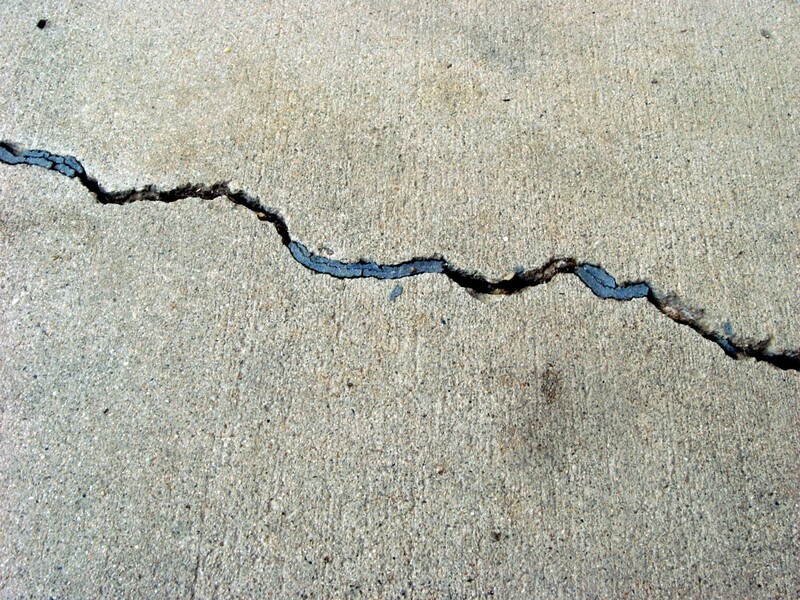 Although all the cracks were filled level with the driveway, in only two years the cracks are back and worse than ever. 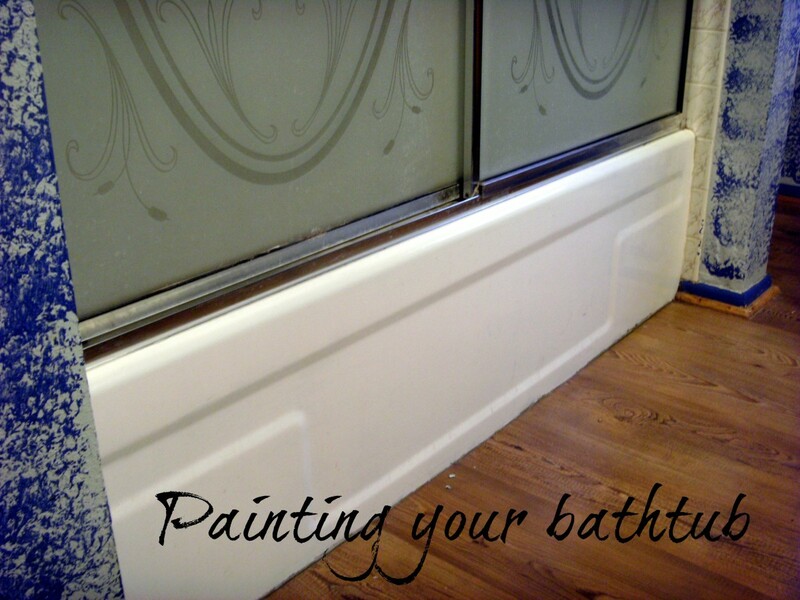 A quick, cheap and easy fix that will help appearance for a short time, it is not recommended for a long term repair. Crack repair products are also available as a specialty cement mix in small pails. Containers range from a quart up to around a 2 gallon size, depending on the quantity of work to be done. 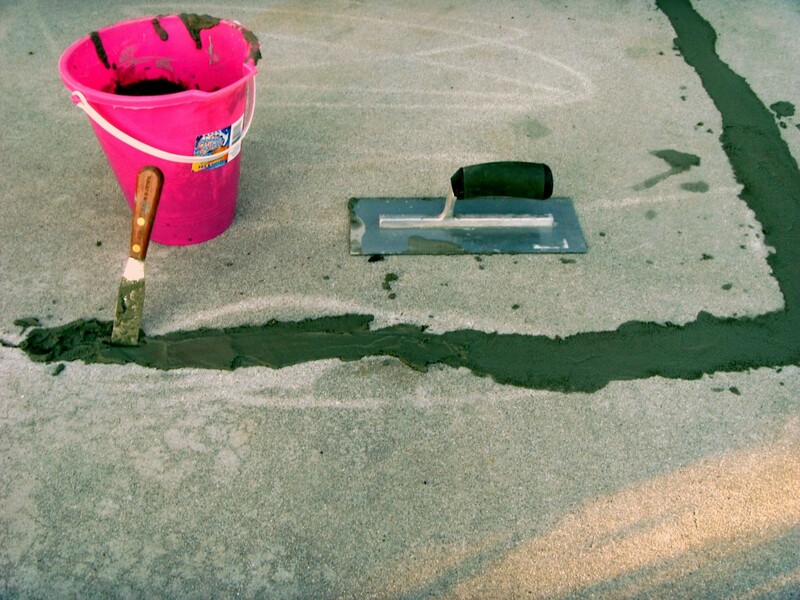 Already mixed with necessary cement and bonding agents it just needs addition of water to begin work. Very small cracks are difficult to fill with this as it must be pushed into the crack with a trowel or other thin tool, but if done properly it makes a lasting repair. It is possible to use a non-shrink grout as well, but it will need the addition of concrete glue. grout is a cement product, but without sand or gravel it is quite weak and will neither bond well with adjacent concrete nor hold up well. 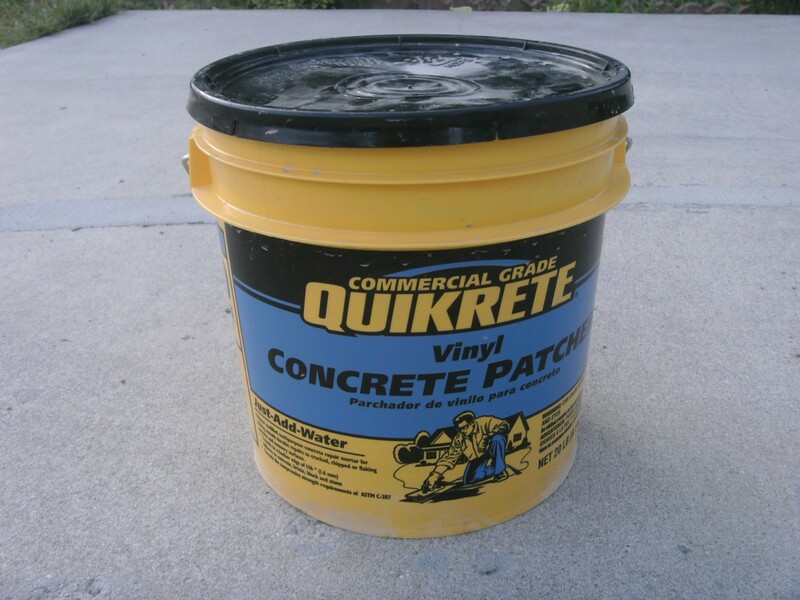 Concrete glue is available in quart jars that is simply mixed right into the grout mix and it both strengthens the grout and provides a bond to the surrounding concrete on the sides of the crack. For large amounts of work it is probably cheaper to purchase non-shrink grout as it typically comes in 50 pound bags for little more cost than the 20 pound crack repair cans. Epoxy based materials are available, but these are probably best left to small jobs. Mixing epoxy and getting it will into 50 feet of small width cracking could be an exercise in futility. Given just one or two short sections of cracking, epoxy provides a good, long term solution although appearance may not be the best. It is imperative that the surface be clean and free of loose material. A pressure washer is the ideal tool for larger jobs, while a simple garden hose may do fine for short cracks. 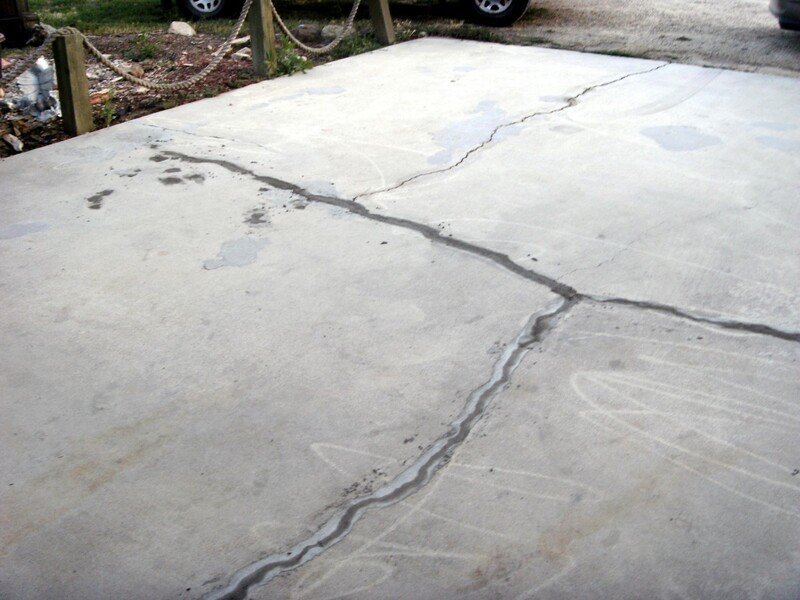 Begin by washing the entire driveway or, if it just a very short crack to be filled, a large area around the crack. You don't want any extra dirt or gravel being blown into the crack before you get a chance to fill it. 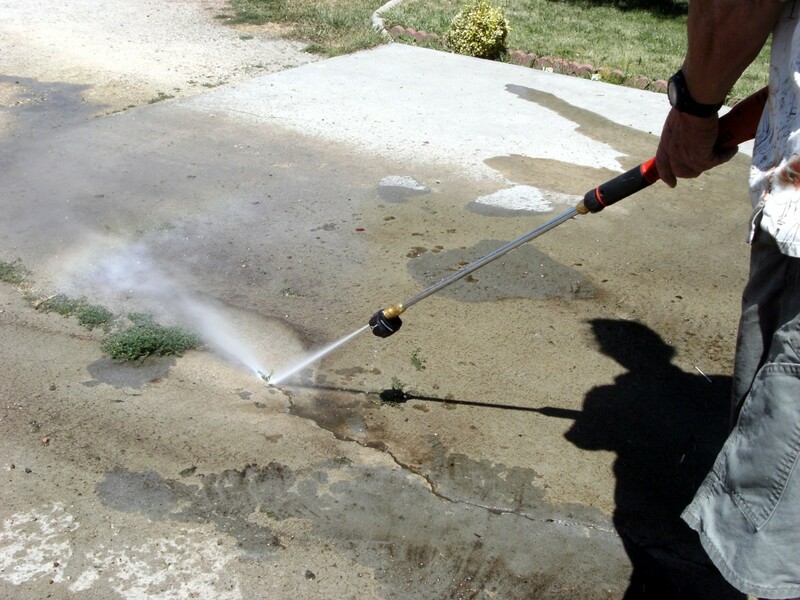 Using a hose or pressure washer turned to the smallest stream possible, blow out all the material possible from the crack. And old screwdriver and hammer can be used to chip out loose material that the washing won't dislodge. Make sure that every bit of vegetation is removed; stubborn growth can be burned first with a weed burner or hand held propane torch. 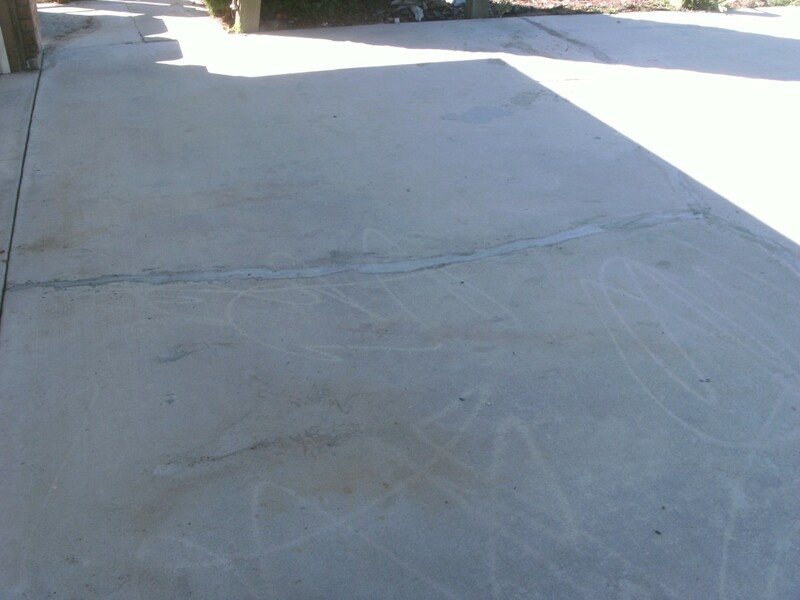 Any concrete that is the slightest bit loose should be chiseled out and removed. It isn't necessary to clean deeper than about ½" - although the concrete is nearly always 4" deep there is no need to apply filler to that depth. Many products will, in fact, advise that depths over ¼" be filled to within ¼" of the surface with sand. If that is to be done, make sure the sand is damp and tamped as firm as possible. It won't be possible to actually do any tamping in a very narrow crack, but this type of cracking is generally shallow in any case and won't need filled with sand. The objective is to provide a good base for the crack filler to rest on - leaving the crack filler "floating" in air will inevitably result in it subsiding to the base below over time. With the small debris cleaned from the cracks, wash the surface once more, taking care not to simply wash it back into the cracks, and you're ready to fill. With the surface clean and prepared it is time to begin filling the cracks. 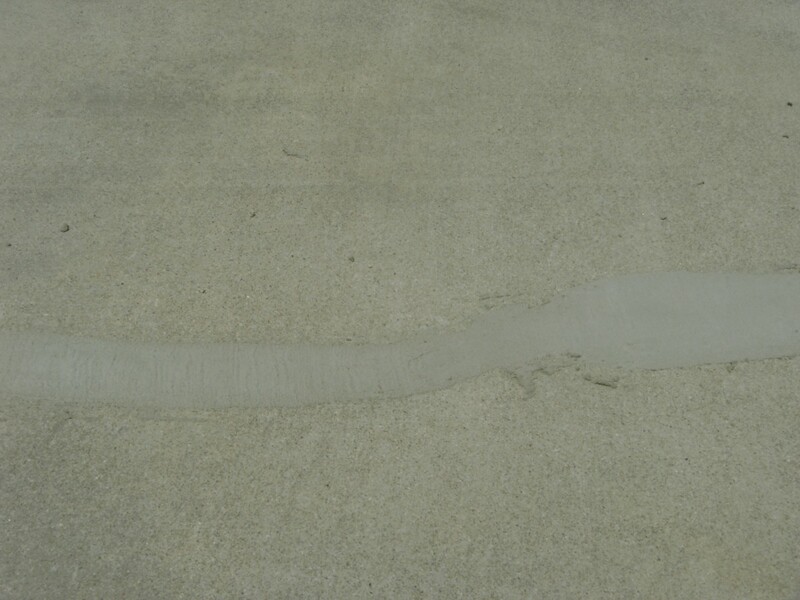 Caulking tube types of filler can be simply squeezed into the crack slightly higher than surrounding concrete and troweled smooth with the adjacent surface. Using a cement based produce will require mixing the material, but be careful - many of these harden and dry very quickly. The instructions with the pail used in the photos suggested to only mix enough for 30 minutes work, but it was drying in less than 20 minutes. It is best to use a small pail and mix only around a quart or so, at least for the first couple of batches. Wash the pail and tools between batches to prevent hard chunks of cement. The patching compound should be mixed a little thinner than cookie dough; not quite thin enough to pour very well, but thin enough to "stuff" into the cracks. If you can form it like a snowball it is probably too thick. Use a trowel corner or small spatula to force material into the cracks and don't simply spread it and hope for the best. Most of the work done in the photos was done without taking real care to make an extremely smooth surface as the entire driveway will be re-surfaced at a later date and this process will take care of small differences in height or trowel marks. Extra care was taken with just one crack, mostly to show what can be done with a little extra time. Place an amount of filler that will more than fill the crack over about a foot of crack and work it into the crack. Pick up the extra material and return it to the pail (if it is left in the open it will dry very quickly) and trowel the section smooth before proceeding to the next section of crack. Press down firmly with the trowel, pushing as much filler into the crack as possible. Foot traffic will be possible in just a couple of hours, but wheeled traffic should be kept off the concrete for at least 3 days. Don't try to push this - it isn't worth having to grind out the damaged filler and re-do it. What filler did you use for your project? I used a caulking gun tube of concrete crack filler. Glad you found it useful. One day I'll probably do mine as well, but as long as I can keep the cracks under control and not growing it's a cost I can do without. Hi Dan. A really helpful hub. We have been filling and working on our drive for 24 years and you advice is spot on. However we had struggled for long enough, last year we had it flagged and it is now a treat to drive on and looks so much better. Great advice. It would be really tough to get the color to match. 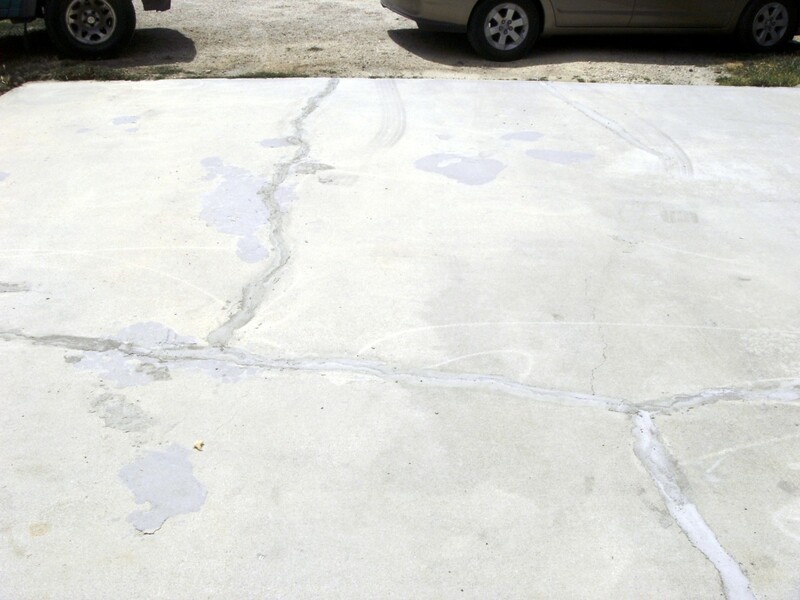 An older driveway is not the color of new concrete; it would take some real trial and error with pigments to match after the patch is dried and completely set. My question is how do you get the filler to match the rest of the concrete. I live in a neighborhood that has forced people with cracked driveways to get a whole new driveway. And its that simple. Such a small job can be taken overboard at times. Thanks, GoodLady - it really is important as cracks will only get bigger with time. Millionaire Tips: Sure you can! It took me about 2 hours, sitting on the concrete and patiently poking filler into the cracks. Nothing difficult about that! 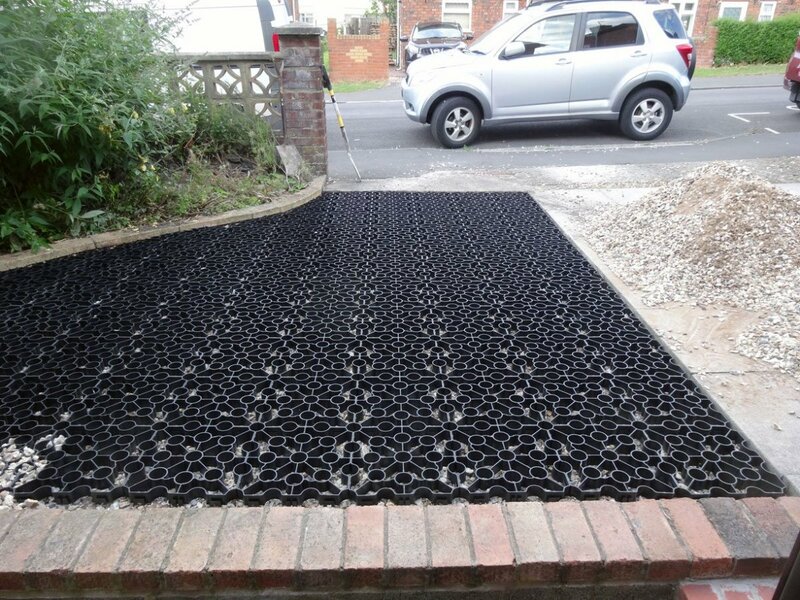 This is great information - I think I might just be able to fill the cracks in my driveway. You are so thorough! What an important Hub for people with concrete driveways.